I love dining out with my young children… at the same table! If reading this sentence makes you mad or despondent, read on. I too once felt the way you feel. Prior to having children, one of my favorite things to do was dine out. When my son came along, I would strap him to my body and off we would go to dine in style. He would so enjoy our outings. When other children would be acting up at other tables, my husband and I would quietly congratulate ourselves for having figured everything out. Then our daughter was born. Our daughter did not share her brother’s fondness for dining out. We would inevitably end up fleeing restaurants with our screaming convulsing child, waiting outside in the bitter cold as our uneaten dinners were feverishly shoved into doggy bags. For all parties involved, we couldn’t get away fast enough. We decided to limit our outings until our daughter reached an age where she could be distracted by conversation or word games or was old enough to get her license and could use the drive-thru window. When she turned four, we ventured out again. She STILL hated it! We were screwed. At this point I was determined to find a solution. After serious contemplation, I realized that my son loved restaurants because he loved observing life and all its details: the smell of food, people laughing at another table, a pretty waitress and all the sights, smells and sounds of dining out. For my daughter, those things were an annoying distraction to her very rich interior life. She loved being cozy at home and creating all kinds of fantastical worlds with her toys. The answer for me was to tap into what each of my children loved to engage in the most and then bring it all to the restaurant. Journals, action figures, barbies, doll furniture, electronic devices, card games... this was going to require an extremely large bag. This bag now lives by my front door at all times and is periodically edited and refreshed. While it sometimes leaves a deep groove in the flesh of my shoulder, it is my salvation. Now, when our kids are behaving and others aren’t, I simply open up my enormous bag and share the bounty. 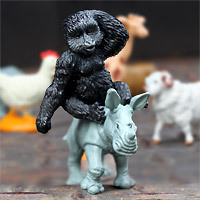 I use little plastic characters and animals to play my own game. I’ll hide a plastic animal behind my back and play “20 questions.” The person who guesses correctly gets to keep the animal. "You Gotta be Kidding! 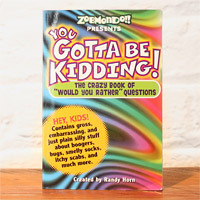 The Crazy Book of 'Would you Rather' Questions"
This book presents hilarious, embarrassing and often gross “what would you rather” questions. It’s always fun to hear all the different answers to such crazy questions and learn the reasons why. You'll most likely learn more than you ever wanted to know about your kids (and your parterns!). I never assume a restaurant will have some of these beauties, so I try to keep a very interesting arsenal in the bag at all times. 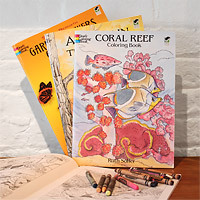 Dover makes some really great nature coloring books that also having interesting facts you can talk about. 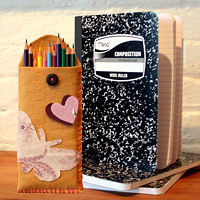 The kids each have a restaurant journal so that all their musings stay in one place. They recite stories while my husband and I write down their words, and then they have a ball drawing the illustrations. 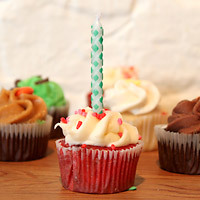 When it’s a struggle to get my kids to dine out, I’ll bring along birthday candles and tell them we are going out to celebrate something… anything! The first week of school, one week before winter break, the pet fish’s birthday. It always works! I use this bag from Restoration Hardware. I love it! It's big enough to carry everything we need to ensure a happy, occupied dinner out! The fun of family board games.